The Personalised Sterling Diamond Cut Circle Bracelet features a beautiful diamond cut circle of life charm, with a ridged design, on a fine trace chain. Symbolising everlasting love, the Personalised Diamond Cut Circle Bracelet is the perfect wedding or Christmas gift. Treat the person you love to this contemporary bracelet which has been created using a diamond cutting technique. Featuring a circle of life charm, with a stylish ridged effect, on a fine trace chain, this bracelet is the perfect piece to add to your collection. 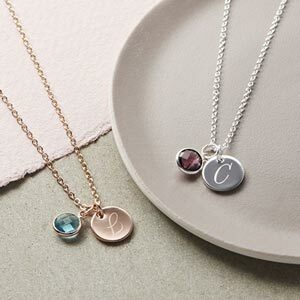 Add an engraved extender charm or even a Swarovski Crystal birthstone for that extra touch. Both the disc and chain are made from sterling silver. 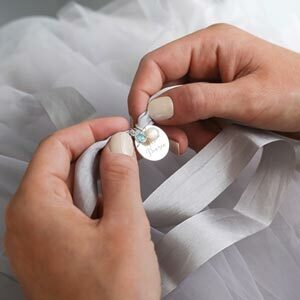 Each birthstone is made from Swarovski Crystal with a silver plated surround.